We spent the last two weekends packing things up over here at the Borrowed Abode, and wouldn’t you know – I don’t feel anywhere near finished. 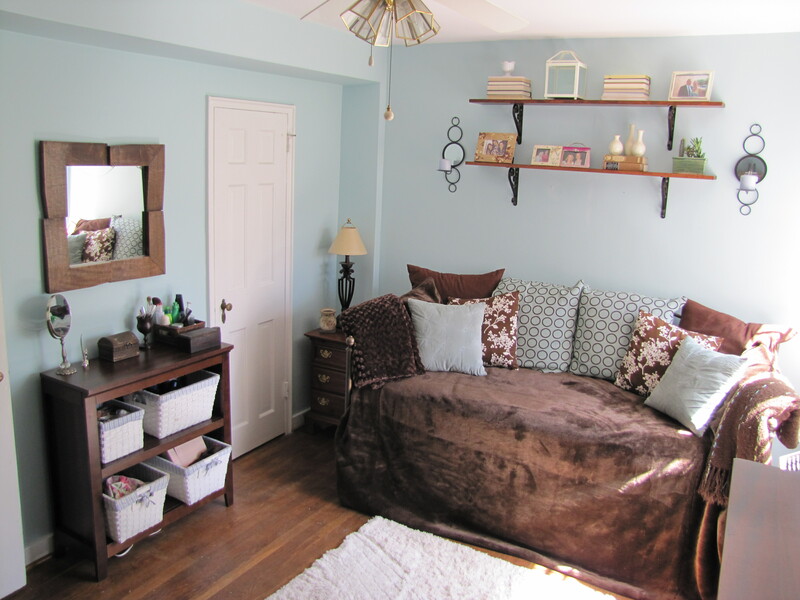 To think I thought my apartment was clutter-free! At least I know I packed like a pro, staying organized and structured despite the upheaval. 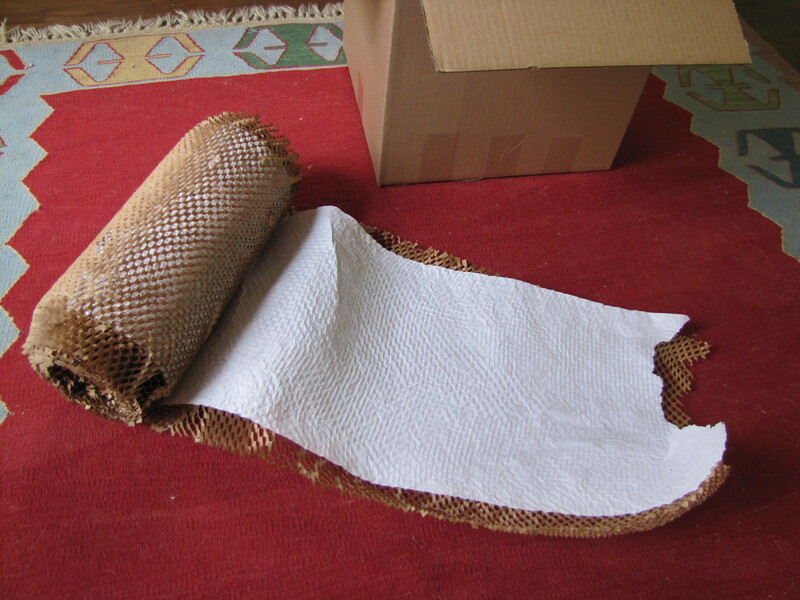 I tried to keep things eco-friendly, opting for “green” packing materials rather than the standard bubble wrap or foam peanuts. If I lived in California, I’d surely have opted for the Earth Friendly Moving company, packing all my items in rented plastic storage bins. Start packing so early that you think you’re nuts for doing so. Trust me, it always takes longer than expected. At least a month ahead of time, save money and a few trees by snagging free boxes and packing paper off Craigslist or Freecycle. 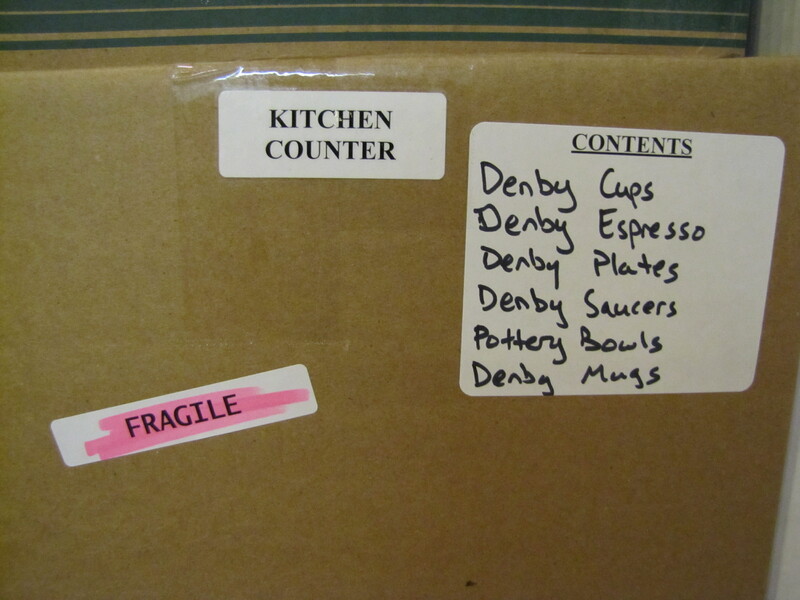 Know where your stuff is, even when it’s in boxes at your new house: label everything. In detail. Each box gets at least two labels: Contents and Location. Prior to packing, I print adhesive labels for every location in the new house. Those labels get stuck to the upper right hand corner of every box, to help the movers know where each box goes. I also print out large adhesive labels that read “Contents”, so that I can create uniform, easy-to-read box inventory lists as I pack. When the box is full, and I tape it up, I slap the contents label right next to the location label. Sounds OCD? Maybe. Uber-useful? Definitely. If the box is fragile, I stick those labels on every side. Save the environment and your wallet. 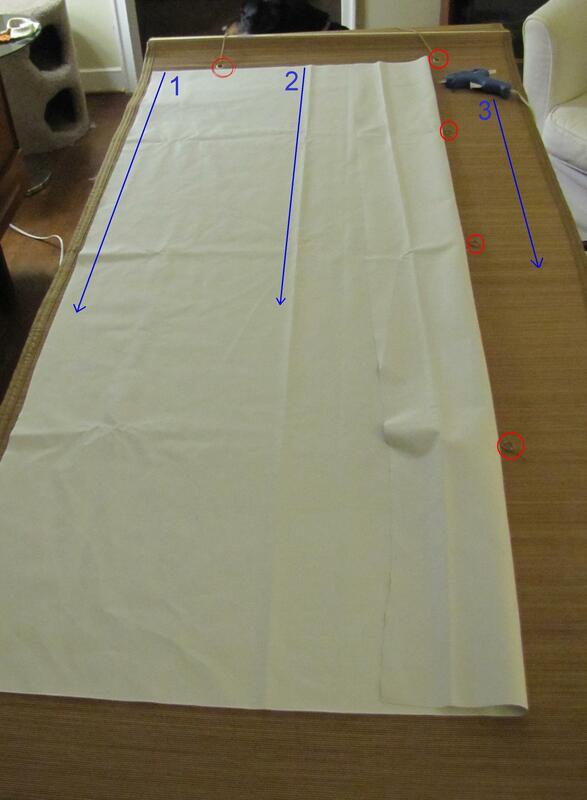 Use towels, sheets, rags, and fabric to wrap breakables. 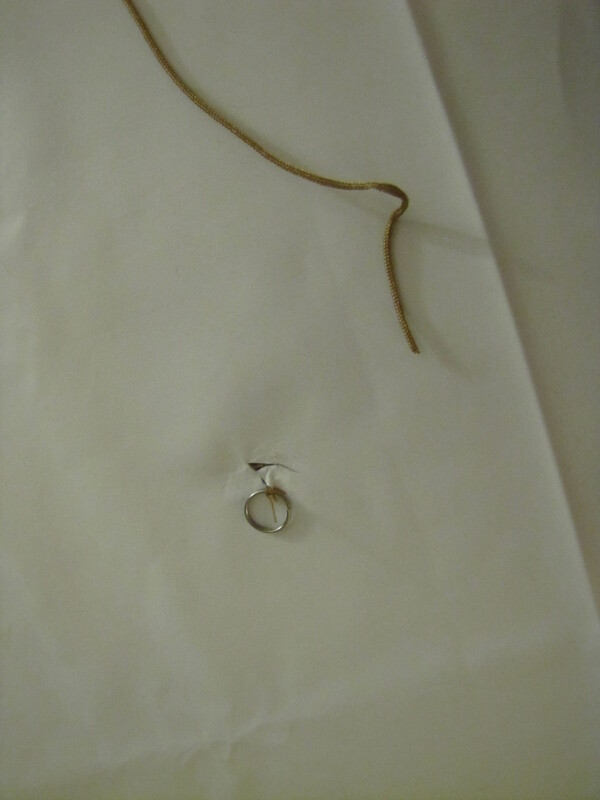 I also picked up some Geami paper for wrapping the super fragile items. 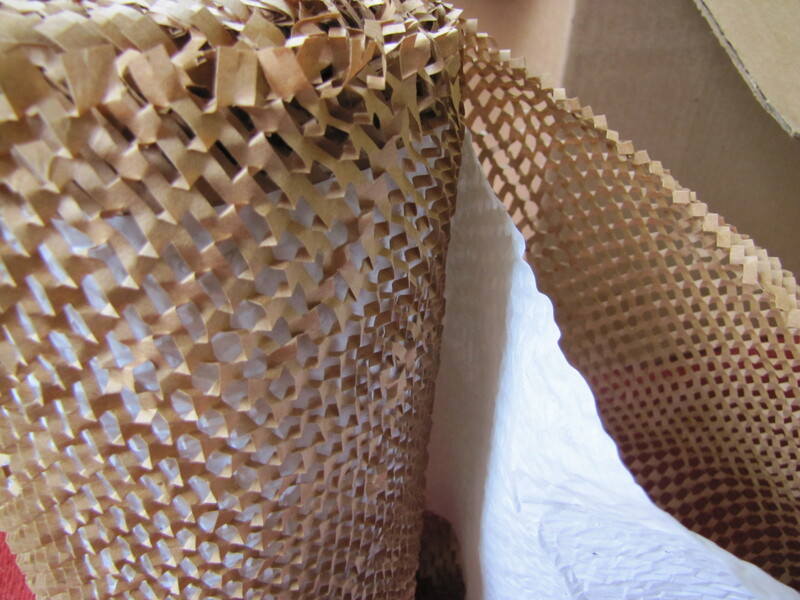 It’s good stuff – made from recyled paper, and just as good as bubble wrap at swaddling wine glasses and other delicate items. Let’s face it, you’re gonna have to have a spot to pile all those boxes you’re about to pack. 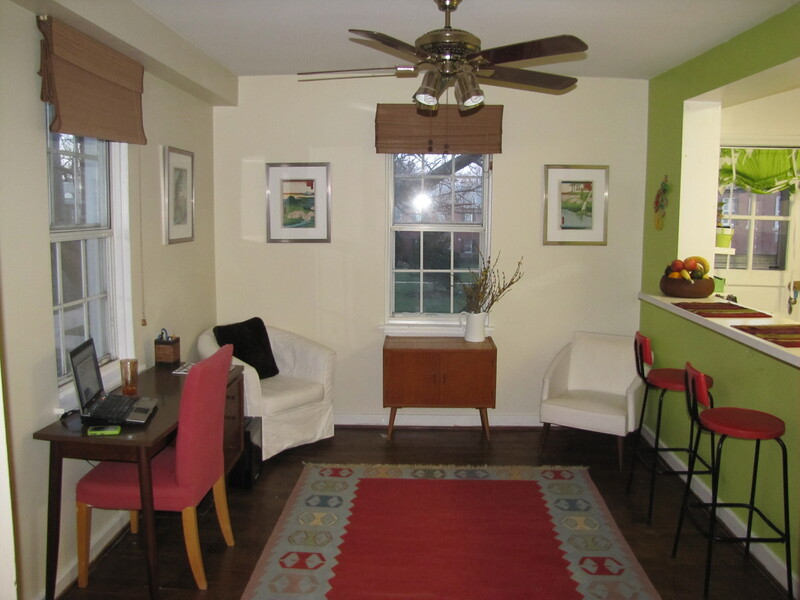 And if you’re like me, you want to keep the house feeling uncluttered and organized despite the upheaval. 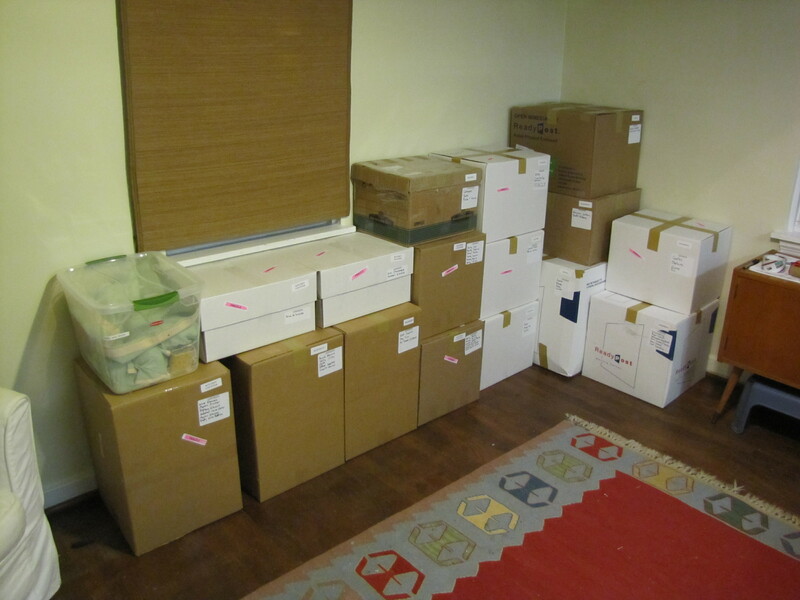 Corral the clutter as much as possible by devoting a wall or section of a room to stacks of boxes. 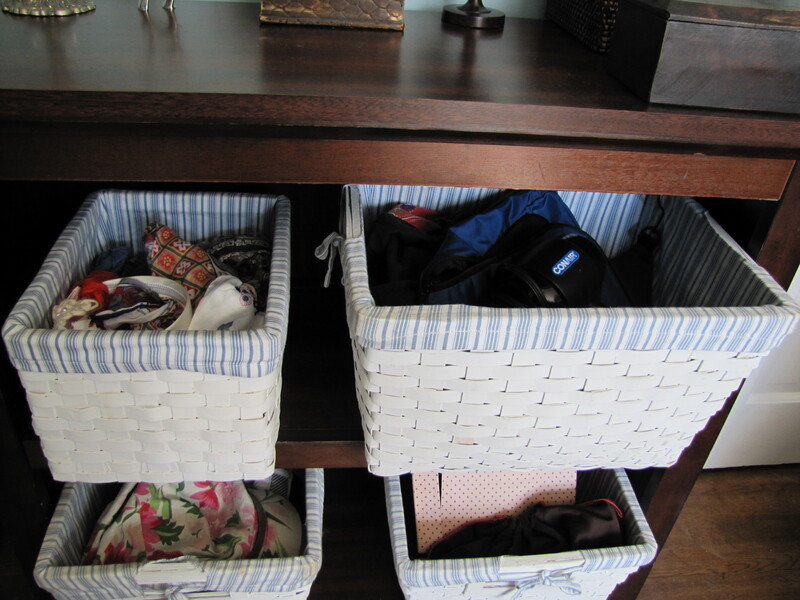 Bonus: Storing them in one place makes for a faster, easier move on the day-of. That’s it for my tips. Did I leave anything out? Any other tips and suggestions would be greatly appreciated – we’re moving soon! Speaking of moving, this will be the last you hear from me until after the move. I’ll return on May 1st bigger, bolder, and better than ever! (Or not. I just liked the way that sounded.) 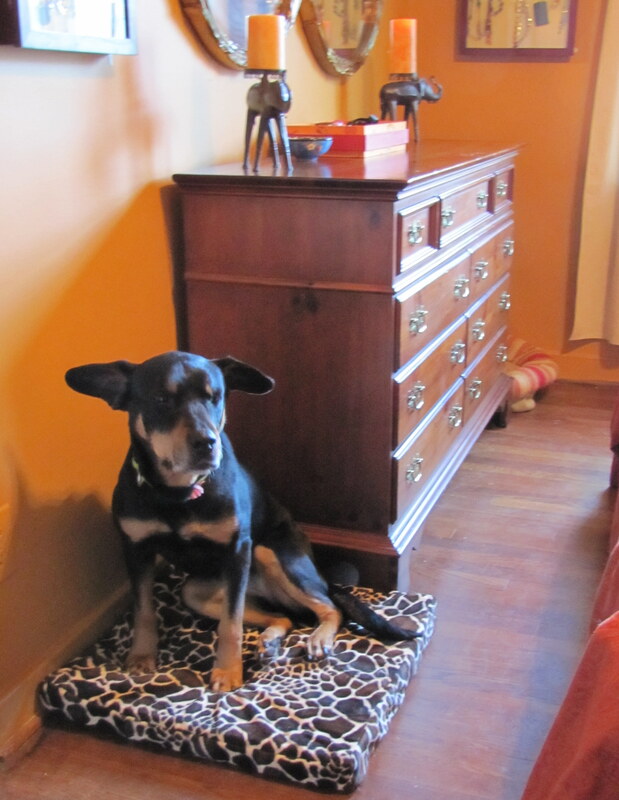 But I will be blogging from a new borrowed abode, and will have a fun surprise to share with you all! If you rent and/or call a small space home, it’s possible your life isn’t overflowing with bathroom storage options. 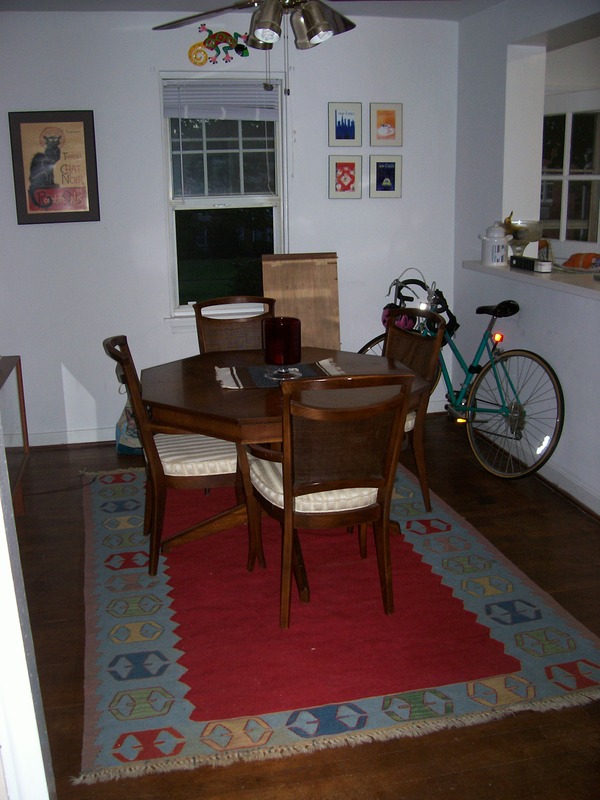 Here’s how I tackled that design dilemma in my condo. 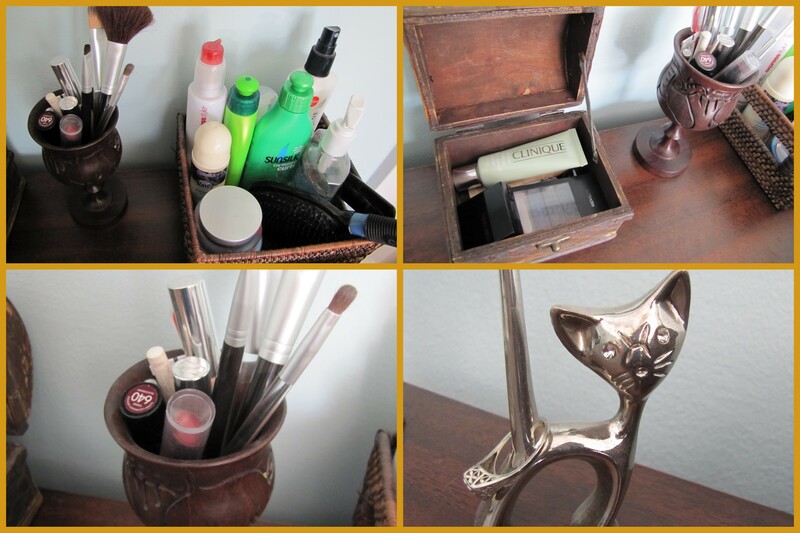 As the last two homes I rented had small bathrooms with pedestal sinks, I had to improvise a decorative and utilitarian storage space for all the girly stuff I primp with daily. A beautification station. 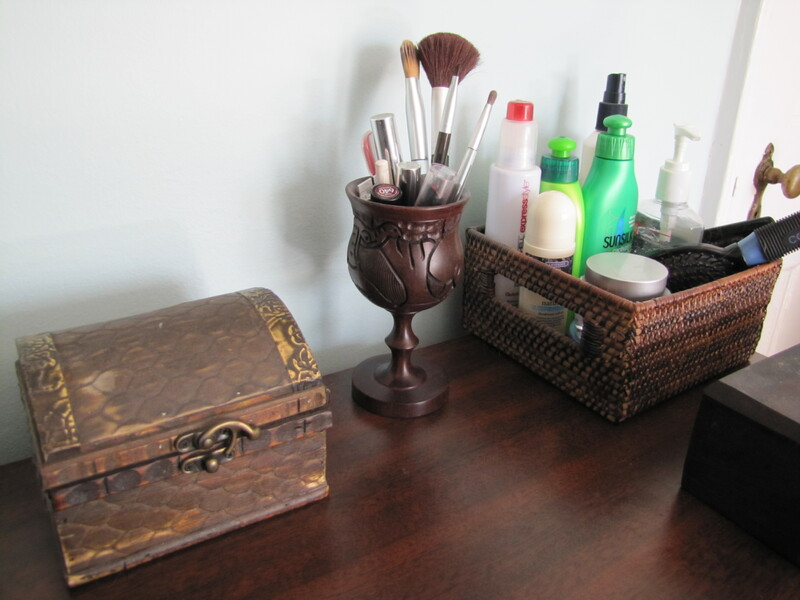 In each situation, I created a space in the guest room for a small vanity area, useable by both me and my guests. Thanks to a bookshelf I had on hand, and a mirror that I snagged on a serious budget, I put the space together for almost nothing. At Pier 1, nestled amongst the mirrors, was this gorgeous wooden one – with a bright little clearance sale price tag announcing the price of only $19. Marked down from about $100! Hello, bargain. It was on clearance because there was a crack running through the glass. It was still awesome. Heck, that crack made it more awesome. The manager wanted to get me a new one. For full price. He reached out for the mirror, and I held tightly to my bargain, as he tried to tell me he couldn’t sell it to me. I argued that it was tagged with a price, displayed on the floor, and he wouldn’t get my money for a full-price one. Then I literally tugged it out of his hand. My stubbornness paid off. I got the mirror! And you know what? To this day the crack shines proudly, like a battle scar. From the battle of the broken bargain. But I digress. . . The top of the bookshelf became the landing pad for my makeup, hair product, etc. 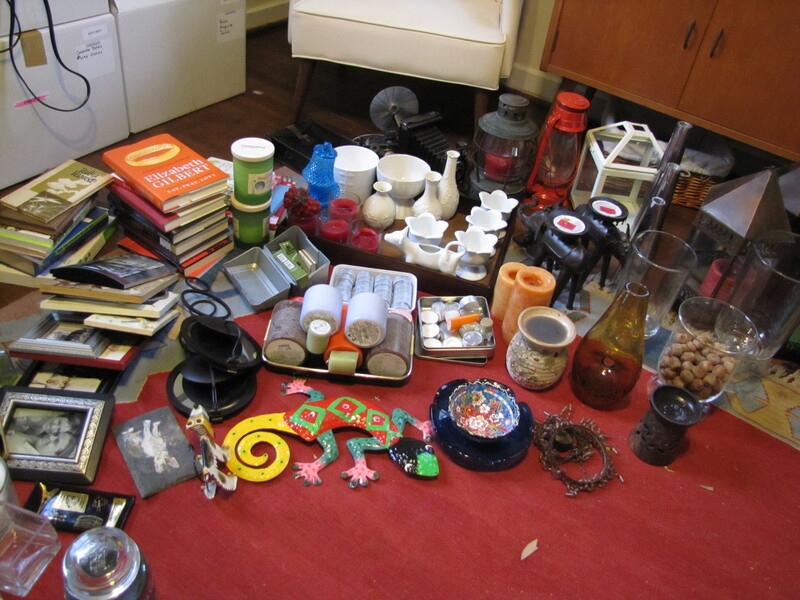 I grouped like items in brown wooden storage containers for a more cohesive look. I collected the containers over a month or two. My mom gave me the cute little cat ring holder years ago – it holds my Grandma’s diamond engagement ring when I’m not wearing it. The bins, which I already owned, fit almost perfectly on the shelves – providing storage for hair accessories, travel toiletry bags, hair dryers, purses, hats, and other girly stuff. I think I enjoy this cheerful little vanity more than I would have enjoyed a built-in cabinet in my tiny bathroom. And now my guests have a convenient place to primp, without tying up the only bathroom in the joint. At the end of the day, the key to making your small rented home personal and functional comes down to one thing: creative thinking. 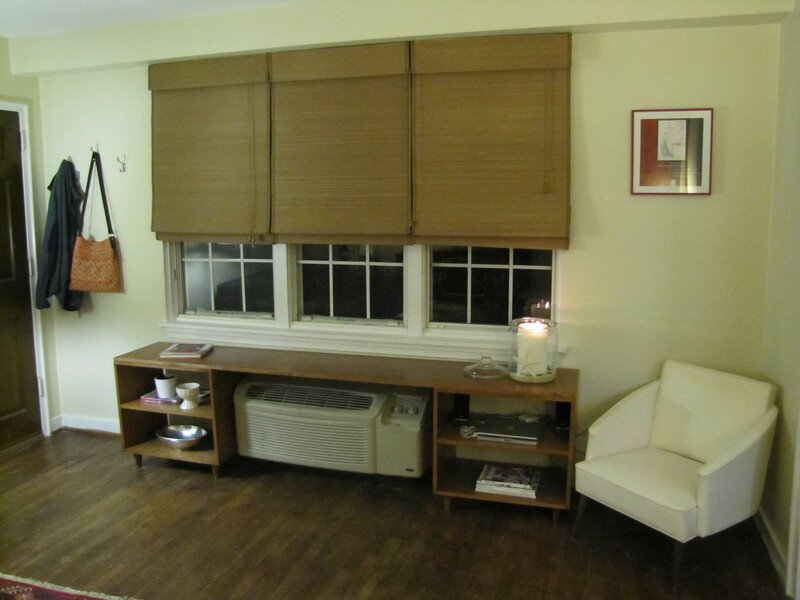 If the apartment doesn’t have a functional space that you need, just create it. There’s always a way. And now I’m curious. 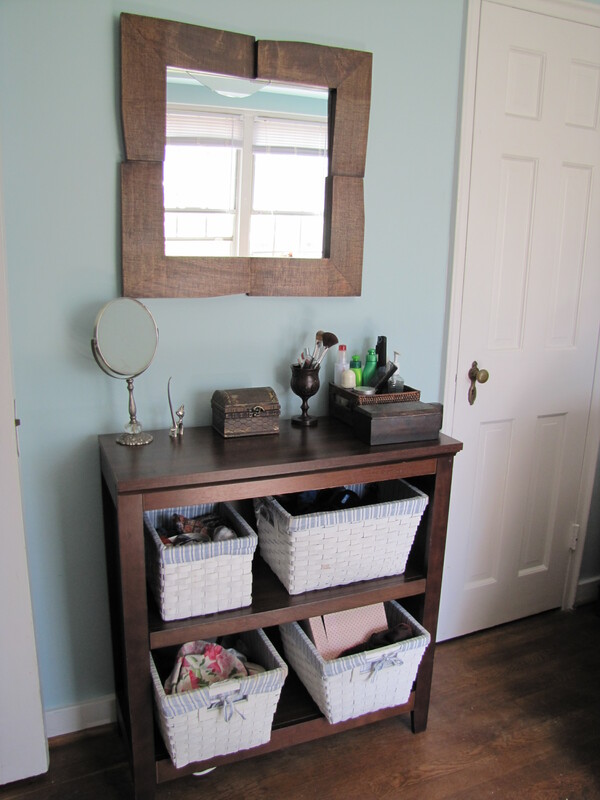 Do you have a vanity area in your home, or do you just use the bathroom area? It is with great joy and excitement that I announce to you: This morning we signed the lease on the completely renovated 1000-sq ft ranch house that we fell hard for a few weeks ago. Even more exciting? 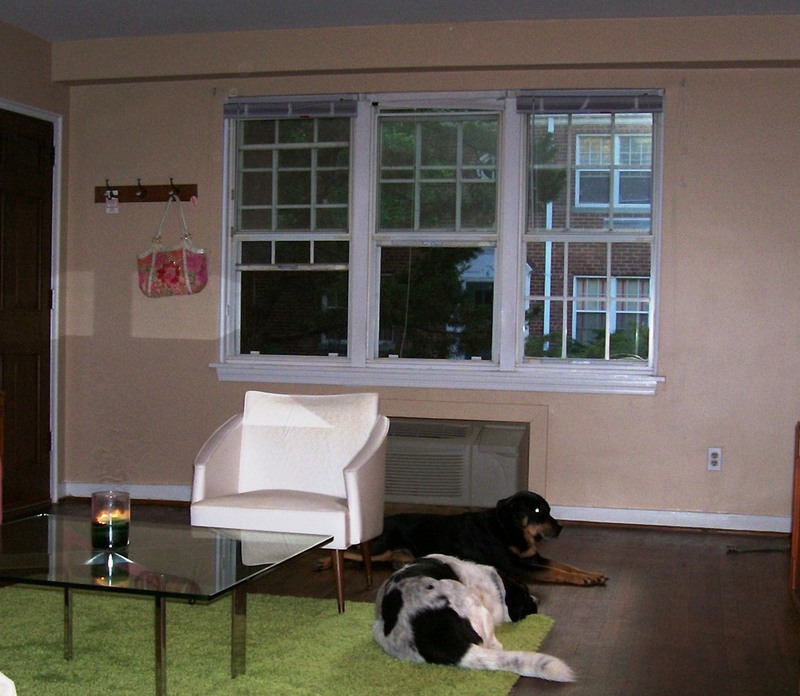 Our landlord gave us the keys when we signed on Tuesday, even though we planned for May 1st occupancy. Um, yeah – he’s pretty much awesome. 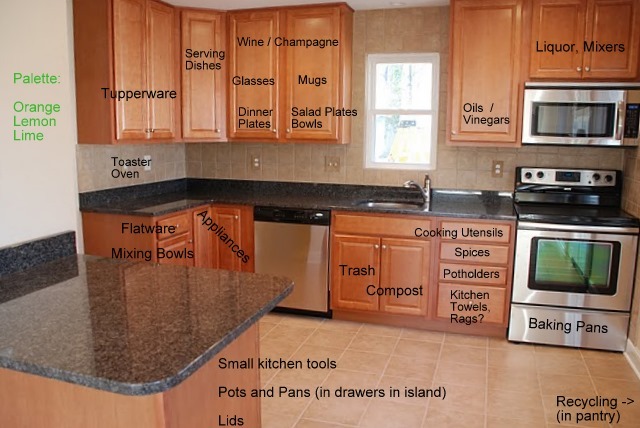 Excited about the fabulous kitchen, I used the text feature of Picasa to plan out where all our kitchen goodies will be stored. Settling into this space will be a breeze. Only one dilemma: where to store the plastic cutting sheets/boards. I just can’t seem to find the right spot. I guess I’ll spend 5 minutes figuring it out once I’ve unpacked everything else. 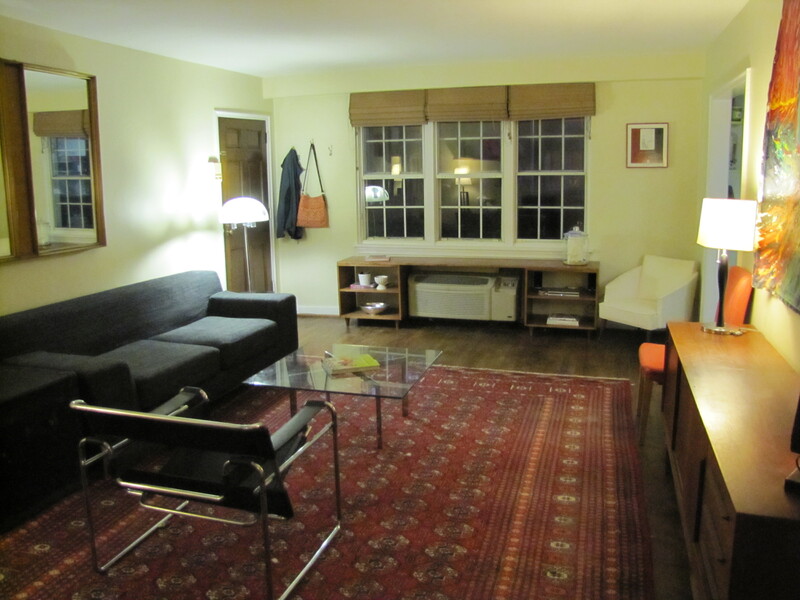 As for the other rooms – I’m still drafting floor plans for them, but moving furniture around is easy and fun. So I don’t mind if they aren’t figured out prior to the move. 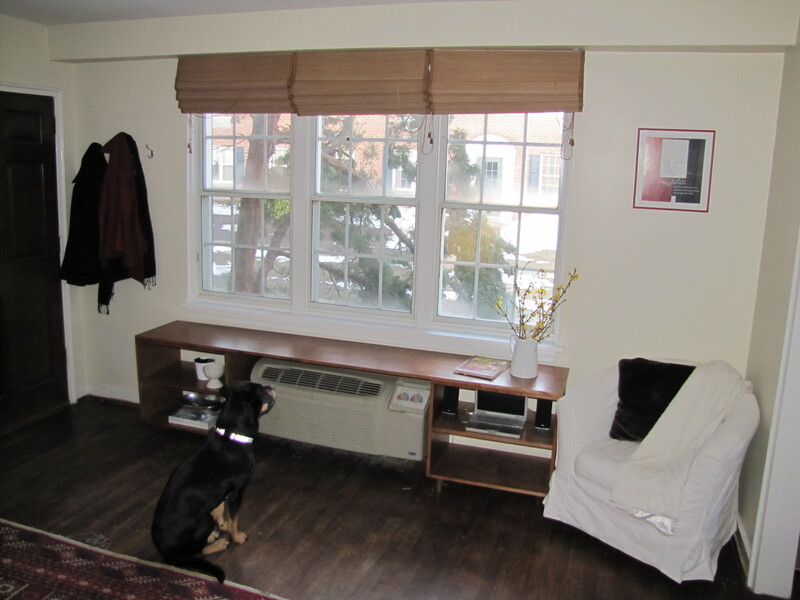 One of the easiest ways to spiff up a rental apartment is to ditch the plastic blinds and bring in some nice window treatments. 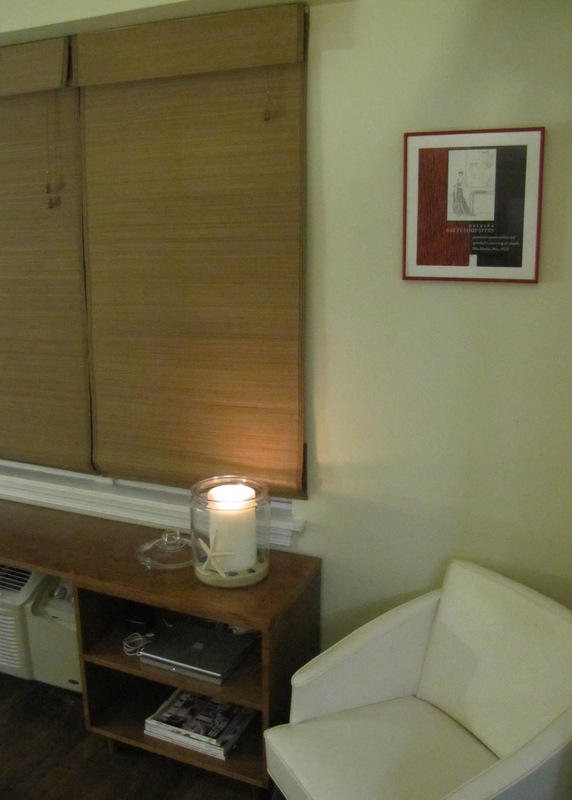 One of the first things I did to clean up the look of my living and dining rooms was to ditch cheap white plastic mini blinds for some budget-friendly bamboo roman shades. As soon as I installed those budget bamboo shades, it was like a different room. And maybe replacing that flesh-colored paint with a creamy off-white helped, too. Measure each window. If you’re choosing an outside-mount, make sure you allow for the shade to extend a few inches beyond the window frame on either side to ensure the shade covers it well. Also measure the length of your window from the spot above the frame where you’d install them to the base of the window ledge. Shop around to find the best deal going. I looked on Amazon, Overstock, Walmart, Target, Ikea, and then some before finally snagging my shades at Bed Bath and Beyond on clearance. Be prepared to pay $20 -$40 bucks per shade. 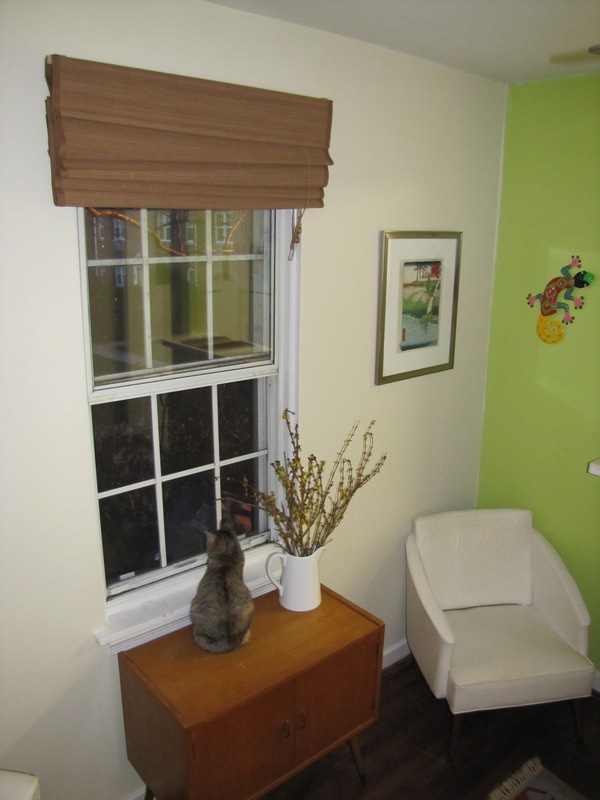 Remove the existing window treatments, saving and storing all parts and hardware for when you move out. Don’t worry, mini blinds don’t take up much room in a closet. Install your new, gorgeous, fabulous roman shades. All you need is a drill, a level, a screw driver, and a tape measure. Mark the holes and level carefully. You don’t want crooked shades! Remember, if you want to create the appearance of taller windows, plan to install the shades a few inches above the top of the window frame. If you have a large window, or several windows side-by-side, shop around to see which is cheaper: one large shade or a combination of smaller shades. If you’re looking for wooden or bamboo shades, match their color to that of the wood furniture in the room for a warmer and more cohesive look. Save a little dough: choose unlined shades for a better bargain. There’s a DIY remedy for the privacy liner, which I’ll share Friday. Installing custom shades may sound tricky, but trust me: It’s really simple. I had 5 shades installed in about 3 hours. It cost me about $175 in all – and it was worth every penny. I’m pretty proud of myself right now. 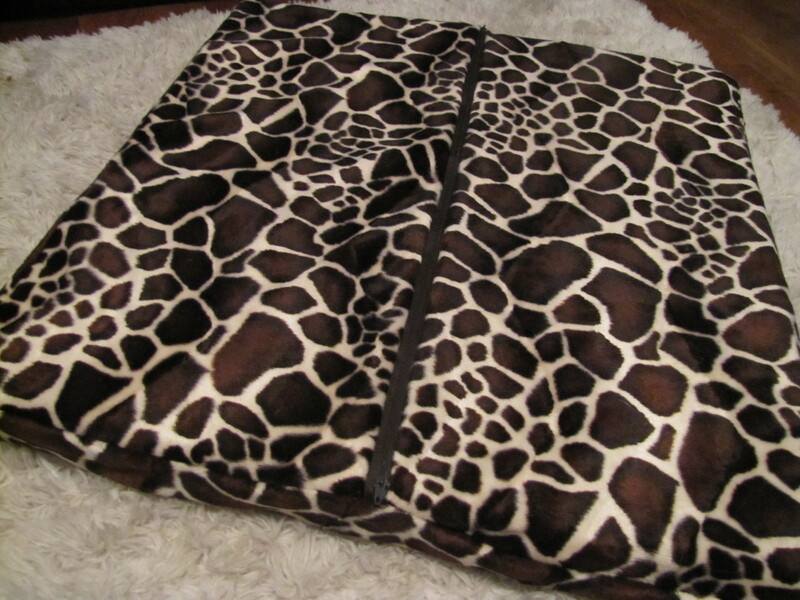 After months of procrastinating, I finally whipped up this dog bed with a removable, washable, zippered cover! 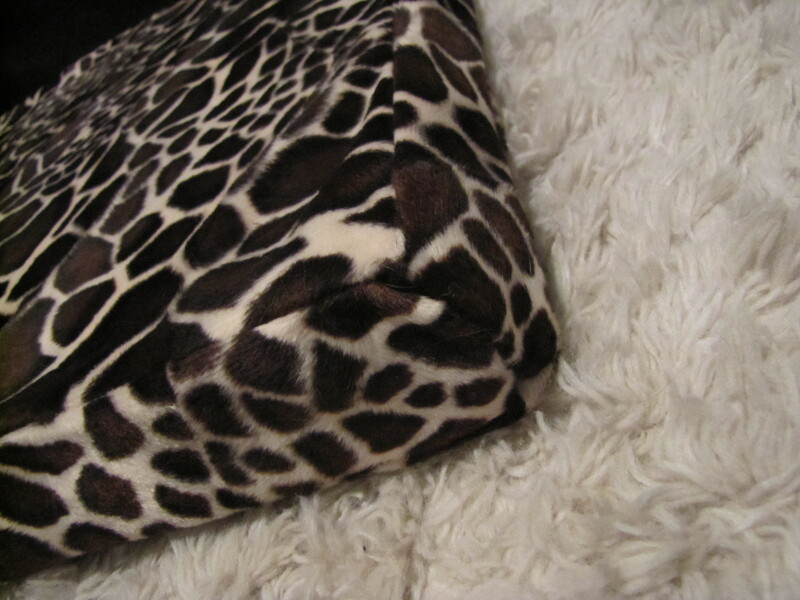 I tackled this project – with no pattern to guide me – and had it done in one hour. At midnight, no less. Charlie’s pretty pleased with it, even if it is accidentally a bit on the small side. 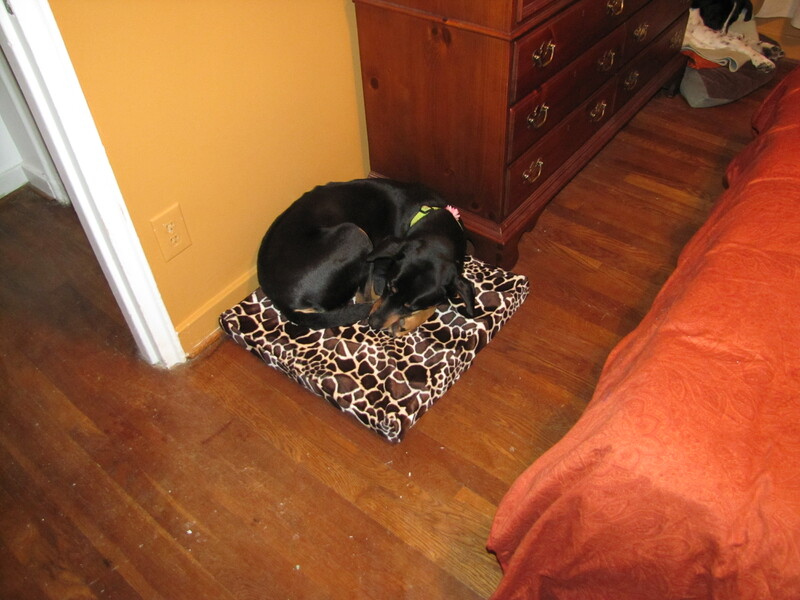 She’s glad that her old smelly bed has been ditched for something more exotic – and let’s face it – clean and new. I even sewed little corners on it! And installed a zipper (my very first) on the bottom of the bed! 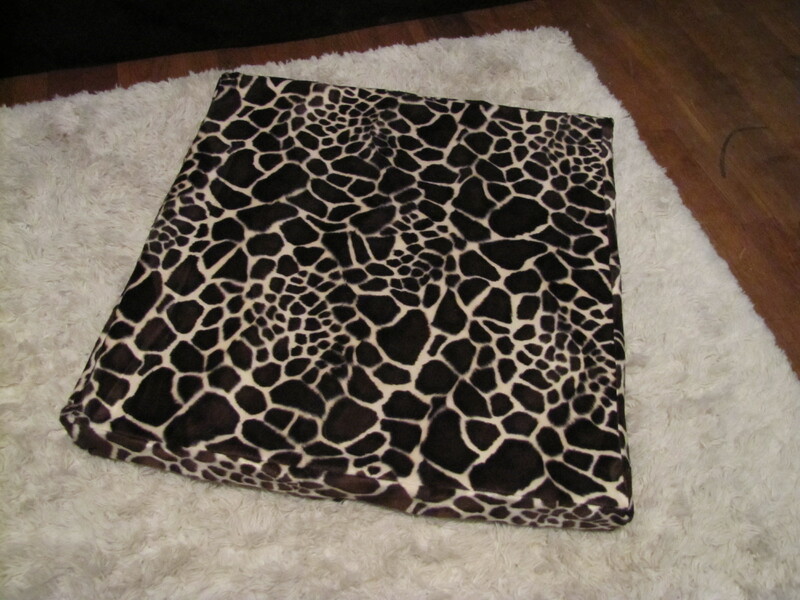 I’m super stoked to have made a pet bed that lets me remove the cover for washing. Once again, it’s a solution that’s pet tested and owner approved. A little birdie told me today that I could save a bunch of dough on the sofa I’m planning to purchase from Crate and Barrel this June. It’s $1500 at C&B, but only $450 on Craigslist. Here’s the catch: the white fabric has a few stains that did not come out with professional cleaning, and there is a small tear in the armrest of the sofa. I think, for that kind of savings, I could make it work. I mean, if I bargain it down to $350, I save $1150. That’s a lot of savings. But is it worth it? I think I could easily throw a fun little blanket over the arm to cover it up. And in reality, I’m the kind of girl who’s not embarassed to have a torn C&B sofa, if it means I got it at a huge discount. Heck, I’d probably be proud to announce to guests that that tear scored me a bargain. I’m silly like that. But what do you think? Am I crazy to consider it?